Single Loop Temperature Controller KS 40-1 - BG electric e.K. 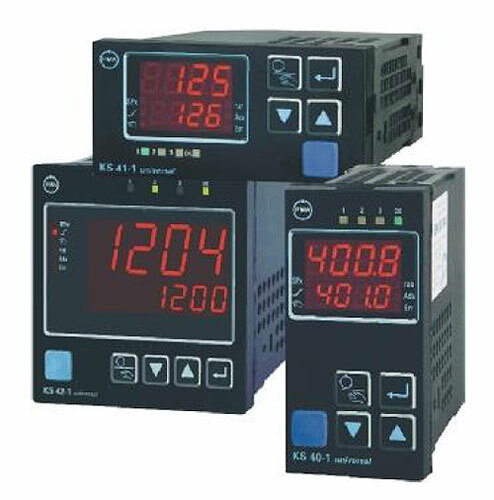 The universal temperature controller KS 40-1 is intended for universal, precise, and cost-effective control tasks in all branches of industry. For this, the unit provides simple 2-point (on/off) control, continuous PID control, or 3-point stepping control. The process value signal is connected via a universal input. A supplementary analog input can be used for heating current measurement or as an external setpoint input. The KS 40-1 has three process outputs that can be 3 relays or 2 relays plus a universal output. This universal output can be used for operating a solid-state relay, a continuous current/voltage output or to energize a two-wire transmitter.